Our challenge this week is to create something using the theme “Guardian Angel”. Our hostess this week Anne Jones made this beautiful arch using different elements and a lovely quote. How do you interupt guardian angels? Heaven above? sweet cherubs? Angels among us? We would love to see your gothic arch creations here! There’s not a lot more to be said about me that isn’t already in my profile. I am married with two absolutely wonderful little boys who are my life. This year my DH and I celebrate 10 years of wedded bliss and I am planning a big party for our anniversary as we only had a very quiet wedding at The Blacksmiths Cottage in Gretna.. Thanks to programmes like “Blue Peter” and “Vision On”, I have always felt inspired to create. One of my earliest craft memories was getting told off in a Geography lesson for not listening – instead I was too busy trying to work out how I was going to get that cheese box, toilet roll tube and cotton reel to resemble a carousel! I did eventually create my masterpiece but to this day I still don’t know where Angola is! LOL! I hope my Guardian Angel inspires you, and I look forward to seeing all your fabulous arches! Have fun! great arch and beautiful theme!!! Oh wow am I really first today. Happy New Year to you all. 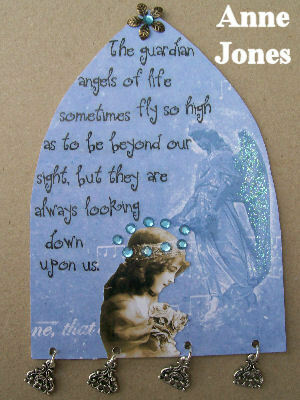 Here is my lovely Guardian Angel Arch. Guess I am not first after all, but there were no comments showing so you just beat me to it Tchou. Here is mine. Thanks for looking. Warm regards and the best wishes for the new year. Hi, it’s my first time here at Gothic Arches and my first time ever, I created an gothic Arch. Hi this is my first time here, and my first time ever for me to create and gothic Arch. Here is my entry, thanks for looking. I’ve been looking forward to the start of the challenges again! Best wishes everyone for the new year!! Thank you for a beautiful theme. “Watch Over Me” is my arch. Here’s mine – sorry it’s a day late! Great to have the challenge start up again. Here is my entry for this week .. wonderful theme! I have added my guardian angel. Nice to have the challenge back. Merci d’avance à celles qui passeront sur mon blog. been lurking so long…finally found the time to join in. i just love this challenge. even though it is so very trendy – still the gothic arches are such a great motif, no matter where or when. Here is mine – I really enjoy making these. Happy New Year to everyone. This is my first entry on this site i think I’m addicted!!!!! Hi this is my first time here and my first time ever for me to create a gothic Arch.